First practice round of golf at Bargara. No one told us that the greens are like “Telly Tubby” hills!!!!!! And, the surface is like “silk” !!!!!!! If I pitched on once, only to watch the ball slide off the other side, I must have done it nearly 20 times !!!! Bumped into Kasee, who is the ground keeper, on the 8th hole. We met her with her partner Raelee and her Mum on “chase the Sun” across the Nullabor. It was Kasee who suggested I play the Bargara Ladies Classic – yes, it’s all her fault!!!!! And, now we (Kasee, Raelee, Ollie & myself) are forming a team to play in the Holden Scramble on Sunday. Should be a hoot – may even stand a chance – Kasee plays off 8 & Raelee off 10. Just got to hit the ball in vaguely the right direction and leave the rest to the other team members!!!!!! Have to say the Bargara course is in great condition and the surrounds are very attractive. 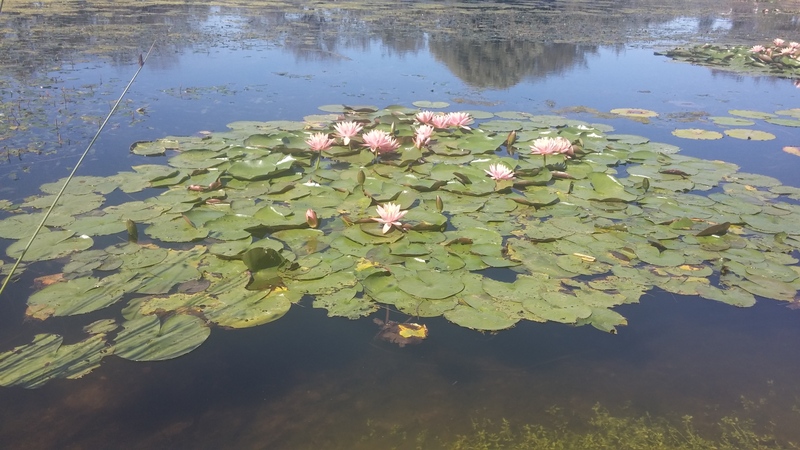 Love these water lilies. Anneke & Hans who we met at Port Lincoln are in the caravan park as well. It was lovely to catch up over drinks & nibbles. Coffee with Anneke & Hans. Beautiful coffee. Hopefully more to come. Then off to post some postcards – Ollie is on his 76th PC to the families in England – so they can follow us on our trip. Also sort our entries for the Holden Scramble!!!!! Didn’t think about there not being an electric buggy ’cause even if there wasn’t one we have our battery trolleys. No buggy – all taken and we’d forgotten we dropped our trolleys off at home to make room for all the caravan stuff when it goes to Brisbane for it’s service. Oh Poops!!!! Kasee offered to carry her clubs and push ours – Bless!!! All solved we have a cart!!! Popped into Bargara Lavendar Farm after shopping & lunch. Tiny little place jam packed with lavender knick knacks – fast departure as Ollie started eye running & sneezing. May have been the lavender or could have been something to do with being the only man in the shop when a bus load of ladies turned up!!!! Facetime with Lucy – in the car in England on her way to Bath University. Where do the years go? Hopefully Claire, Chris & Emily had a large box of tissues with them for the return journey!! Facetime with Tim & family. Freya had her first week at proper school. What did she do there Granny asks? Made lots of friends – reeled off about 10 names. She is obviously happy about school. Able to congratulate Ethan on his mile run – aged 7 – not sure that I knew what a mile was then. We may be in Australia and travelling around but the technology today (which we all curse regularly when it doesn’t work properly) is incredible. Now for that early night. This entry was posted in Uncategorized on September 24, 2016 by aloeliz.